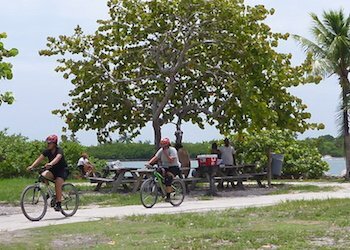 Bill Baggs State Park boasts over a mile stretch of wide white sandy beach along the Atlantic coast. Very low key without the glitziness of South Beach, this is a great spot for a day of relaxing. 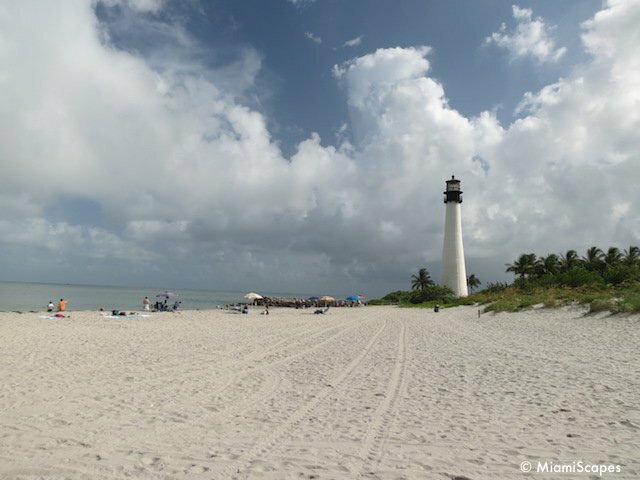 With the Cape Florida Lighthouse towering over it, this is a very enjoyable and shallow beach with a gentle surf due to the offshore reefs that protect it. 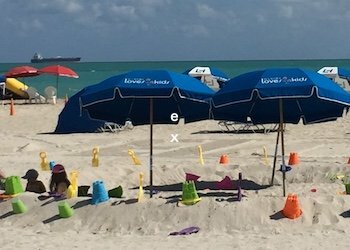 It slops very gradually and with almost no waves, it makes entry and exit very easy, nice for the little ones as well as grandma and grandpa. But one thing to point out about it is that there are NO LIFEGUARDS on duty, it is swim at your own risk. 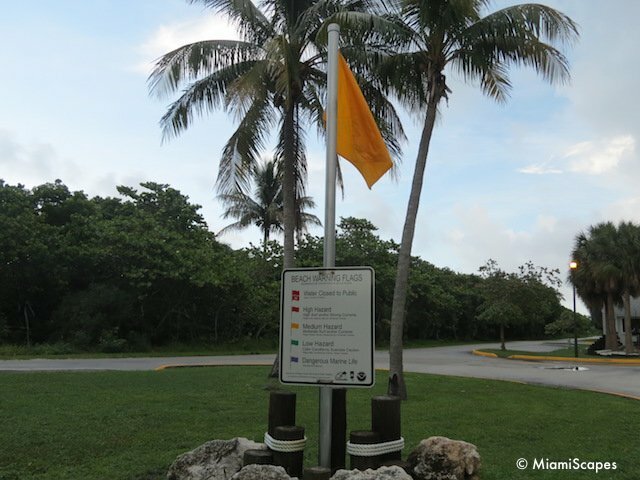 You need to be mindful of the Beach Warning Flags posted by the ranger station at the entrance for any possible alerts. 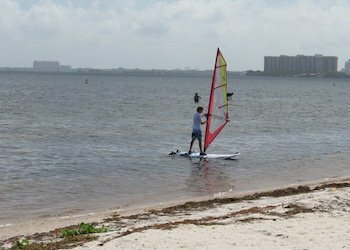 There's lots to do at the beach and many sports and concessions available that make it easy to either spend a lazy and relaxing day at the sun as well as having an action-packed spell kayaking or pedaling away on a hydro-bike. 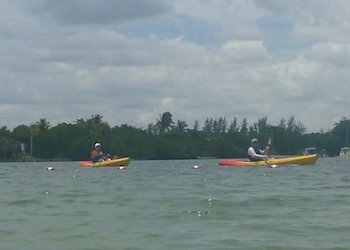 Kayak Rentals either single or double kayaks. Prices start at $20 for a single kayak or hydro-bike for one hour. 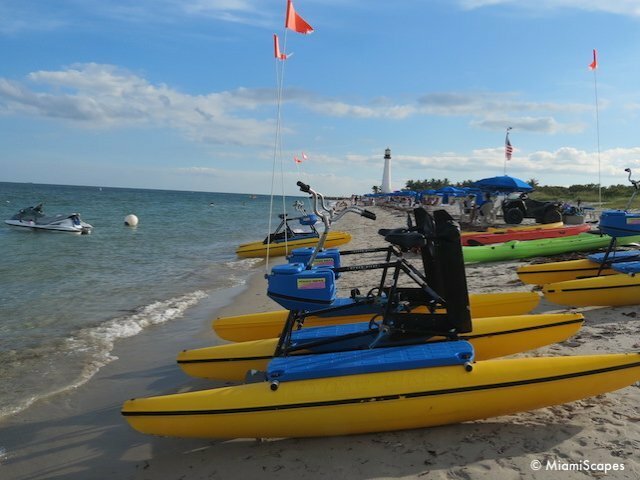 You can also launch your own kayak or canoe from the designated spots on the beach. 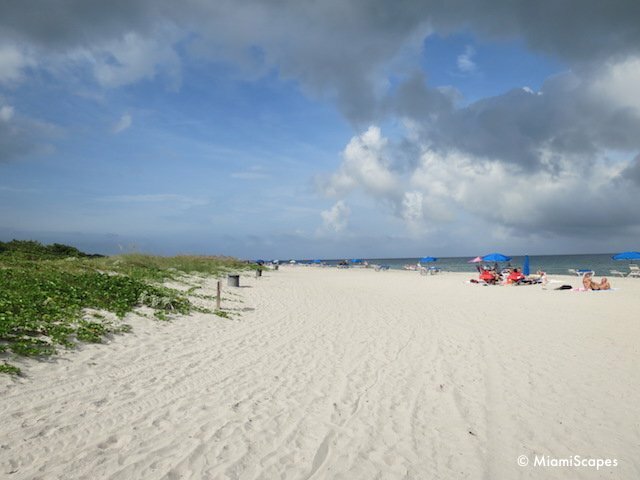 The beach at Bill Baggs, like the rest of the park is maintained in its natural state. 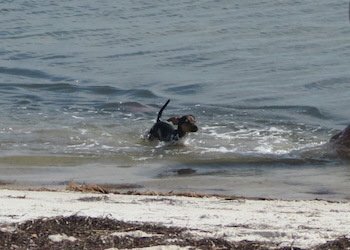 As such, there is seagrass hugging the shoreline and oftentimes it washes ashore. Some people are put off by this and think the beach is "dirty" but the seagrass which is part of the ecosystem helps keep the ocean clean. 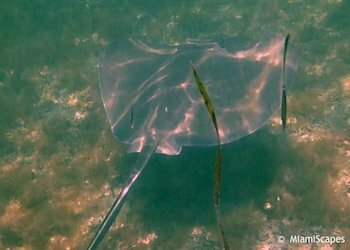 You can snorkel from the beach and look for interesting critters among the seagrass or head over around the rocky jetty where little fish abound but be careful with the tides and the surf. You don't want to end up crashing against the rocks. 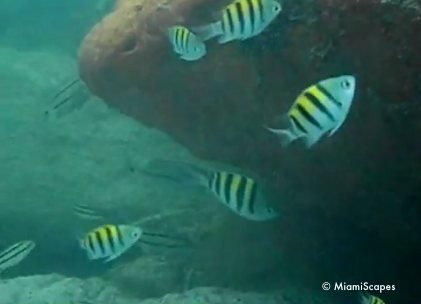 We often see sergeant majors, small grunts and other small colorful fish and occasionally a barracuda darting by. 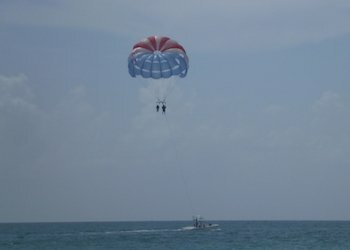 The closest coral reefs are about six miles offshore so not really an option to get there for snorkeling. 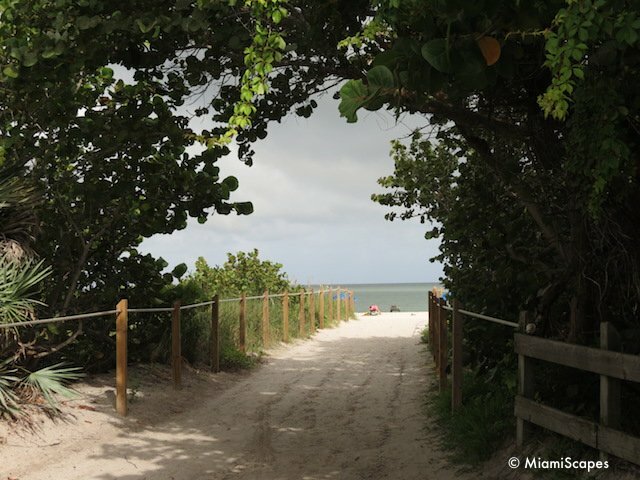 The beaches at Bill Baggs are on the left side as you enter the park. There are two huge parking lot areas, but get there early on weekends as they fill up quickly. 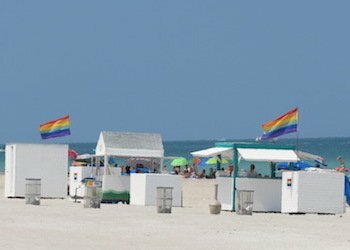 See our Bill Baggs Map here. 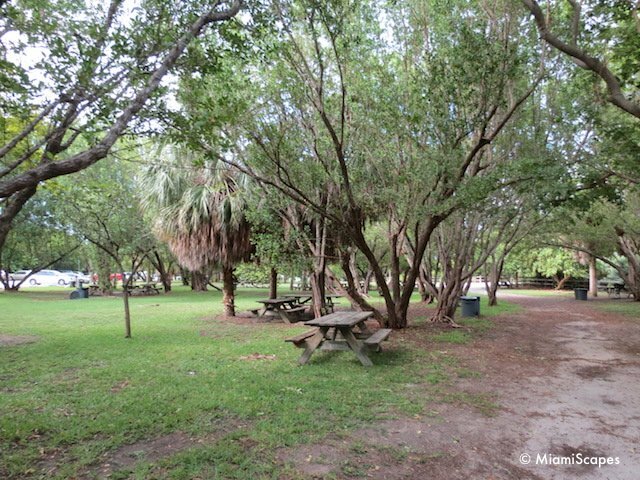 From the parking lots you will first see the picnic areas where the pavillions, picnic tables and grills are, and the narrow paths spaced throughout that cut through the dunes and provide access to the beach. 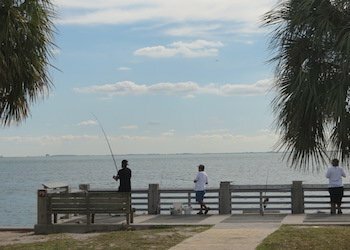 If you've had enough sun for the day, why not take a look at the Lighthouse, go for a walk or hire a bike and explore some of the nature trails, go fishing, have a picnic or just cool off at one of the two restaurants that offer casual dining choices.